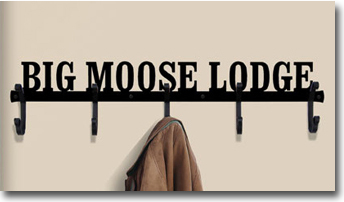 Our custom, personalized, coat racks, hooks, are created from wrought iron to be wall mounted indoors or out. They have a baked-on powder coating to resist rust and ensure many years of use. They are handcrafted in the USA and shipped direct from the factory located in Fabius, New York. Our Flat Rate shipping method is $6.95 on items listed below!